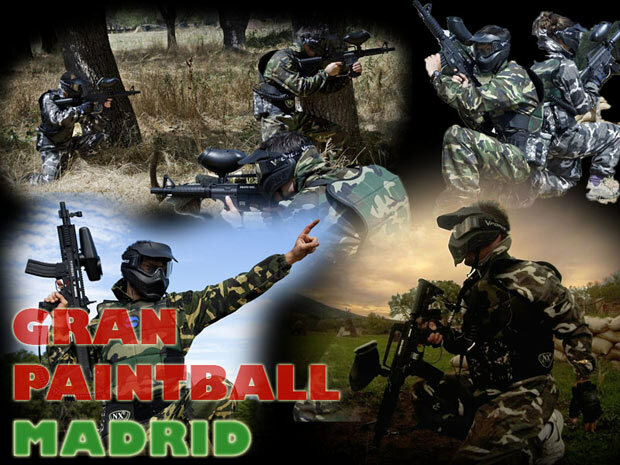 Enjoy the best stag parties with Gran Paintball Madrid! We prepare bachelor and bachelorette parties, as well as joint parties, where our obsession is that they are original, fun, different and exclusive, and that the bride and groom remember all their lives! Do you want to make a different plan? Do you want to spend a really fun day with your friends? Come and play at our Paintball fields, the biggest and most modern in Spain, and surprise the groom with a super game loaded with adrenaline! Hundreds of groups of friends have come to enjoy this special day with us, and we are proud to be able to say that you always leave with a huge smile… Especially the bride and groom! Our Multiaventura company in Madrid will completely prepare your bachelor party! Do you want us to dress up the groom? Do you want to do other activities such as horse riding, paragliding, climbing, kayaking, magic sessions, humorous monologues, etc.? Do you want other types of services? We give you everything! If what you want is to enjoy an original day in the middle of nature, doing multiadventure activities, we assure you that with Gran Paintball Madrid you will have the best bachelor party in the mountains of Madrid and surroundings. Play in the best Paintball in Madrid, hiding in our 9 themed scenarios with airplane, helicopter, bus, boats, military vehicles, tank, forts, towers, forests and hundreds and hundreds of obstacles will make you pump adrenaline as never in your life! Surprise the groom by enjoying an exciting team game, dressed in our top-of-the-Gear outfits, and shooting with weapons that no other field in Madrid has: our famous Bravo One Elite markers, authentic replicas of the M-16s. Look for opinions of Gran Paintball Madrid, the referent bachelor party company and let our own clients tell you the experience they have had with us! Open bar of soft drinks or beers for 90 minutes for only 5€. Many other eating options, just ask us! The girls are warriors, and that’s why they come more and more to Gran Paintball Madrid to celebrate original daytime bachelorette parties doing our multi-adventure activities in which the companionship and ties between the participants are reinforced through the exciting games you play with us. Paintball is not an exclusive activity of men. Paintball is one of the sports that create stronger bonds, and above all it is one of the funniest activities that can be done, so they are perfect for bachelorette parties in Madrid. Thanks to the fact that we equip you with the highest degree of protection (gloves, vests, camouflage suits and cartridge included) you do not have to worry about the shots, and you only have to enjoy the exciting games in the biggest fields in Spain, and in a privileged natural environment. In addition, you can complement the activity with a tasty barbecue, with our famous open bar, or with our other star activity: The gymkanas. In addition to Paintball, we recommend our famous gymkanas for different bachelorette parties in Madrid. The gymkanas that we make in the daytime bachelorette parties in Gran Paintball Madrid consist of a series of tests in which we assure you that you will not stop laughin! They last about 90 minutes, are made outdoors taking advantage of the beautiful environment, and only cost 10€ per person! Our entertainers will make sure that both the bride and her friends give it all away and that you enjoy one of the most original and fun activities that can be done. The mixed farewells are hot right now, and in Gran Paintball Madrid we never get tired of seeing how groups of friends come with the bride and groom and enjoy an unforgettable day with us! Paintball is the perfect activity for mixed bachelor parties, as it has many possibilities, both when making teams, as in the different games we do. In Gran Paintball Madrid we always play a lot of different games, in which we add details and surprises to give a different touch to your farewell. Can you imagine a game in which the groom and the bride go after all of you? (Yes, with special markers that shoot 10 balls per second … hehe). Or the rivality that may exist in a game between the bride and her friends, and the groom and his? What if the mission is to rescue one of the two? Or if we give them an extra life? The possibilities are endless, and we can complement this fun plan with a tasty bbq, an open bar, or another activity like the gymkhanas. Fun guaranteed! We have specially prepared packages for you to do all day farewell activities. Are you looking for cheap or low cost bachelor parties in Madrid? Or maybe weekend packs? The possibilities in the packs of stag and hen parties in the Community of Madrid are endless, so we will be happy to advise you. Check out our Prices and Offers section, where you’ll find ideas for all budgets! If you want any other activity for your bachelor or bachelorette party, or you want a weekend pack, just tell us and we will organize everything for you! Call us and ask for a budget without commitment at 636 475 305, send us a WhatsApp, or write us an email at info@granpaintballmadrid.es. We will be happy to help you.